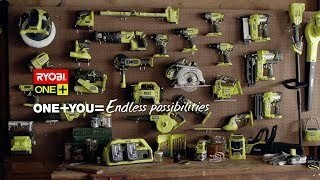 Get your DIY tool collection off to a flying start with the RYOBI 18V ONE+ 3-piece value kit + storage cabinet. This single kit includes everything you need to tackle any task around the home or workshop. The 18V drill driver is the perfect everyday all-rounder, quickly completing common tasks around the home. For more grunt, the impact driver delivers 170Nm of torque to see even the toughest jobs through. And once the job is done, the 18V blower can take your workspace back to looking crisp and clean. To complement this range of ONE+ tools, included are two 4.0Ah Lithium+ batteries and a fast charger. So you can spend less time charging and more time getting the job done. Meanwhile, the handy garage storage unit can keep your tools ready for the next task. For anyone who takes pride in their DIY tools, the RYOBI ONE+ 3-piece value range + storage cabinet is the perfect package. Grab your RYOBI 18V ONE+ 3-piece value kit + storage cabinet from your local Bunnings Warehouse today.